Congratulations on the birth of your child! The Parish Community shares in your joy. Thank you for wanting to have your baby join the family of the Church through Baptism. By asking for your baby’s Baptism, you are publicly thanking God for His gift to you and making a commitment to bring up your child in the Christian faith. We will help you carry out your decision by giving you our wholehearted support. Leighlinbridge Church: Saturdays at 6.00pm and Sundays at 12.00 noon. Baptism Ceremonies are by appointment only. To arrange a baptism please contact the Parish Office. The parish records the baptism of your child in the Baptismal Register of the parish. This record includes the full names of the child, parents and godparents, the child’s date of birth, the date of the baptism and the name of the officiating priest or deacon. 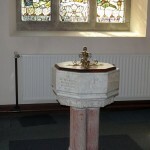 A Ceritificate of Baptism can be issued by the Parish Office as and when required. Copyright 2011 Leighlin Parish. All Rights Reserved.